CLICK ON THE PHOTO TO EXPAN. Photo copyright 1990 by Anne K. Landgraf. Chapter 7: Dennis Kana`e Keawe: Kapa / Tapa. - An ancient-style Hawaiian cape begins with thousands of tufts of feathers. 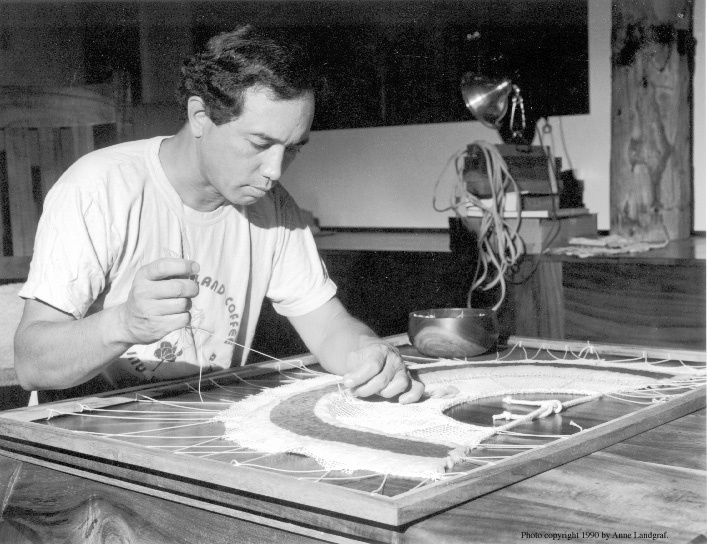 Using twine, Kana`e Keawe secures each tuft into a net framework. Once braided from olona, a native shrub, the original netting material has been replaced here with cotton netting from a fishing supply store. Photo copyright 1989 by Bernie Baker. Chapter 6: Brian Lopaka Keaulana: He`e Nalu / Surfing. 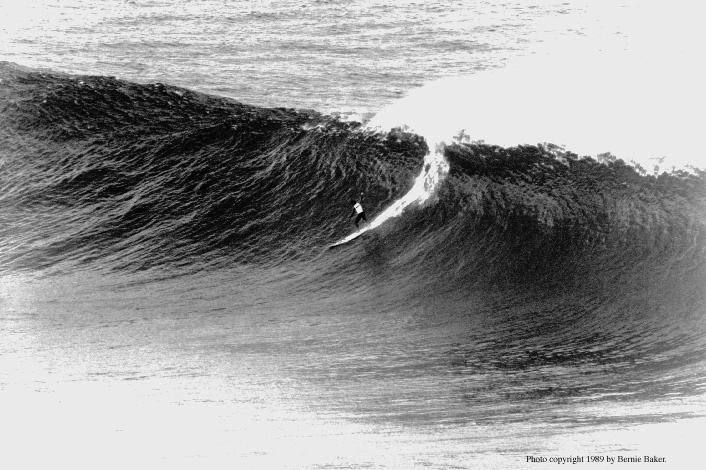 - Brian Keaulana drops down a twenty-foot wave at Waimea. When a surfer wipes out in a swell this size, Brian says it feels like "being one ant flushed down a toilet." Brian survives by having the right surfboard, being in top physical condition, and, mainly, knowing the ocean. Photo copyright 1990 by Anne K. Landgraf. Chapter 9: Mahealani Kamauu: Pono / Righteousness. 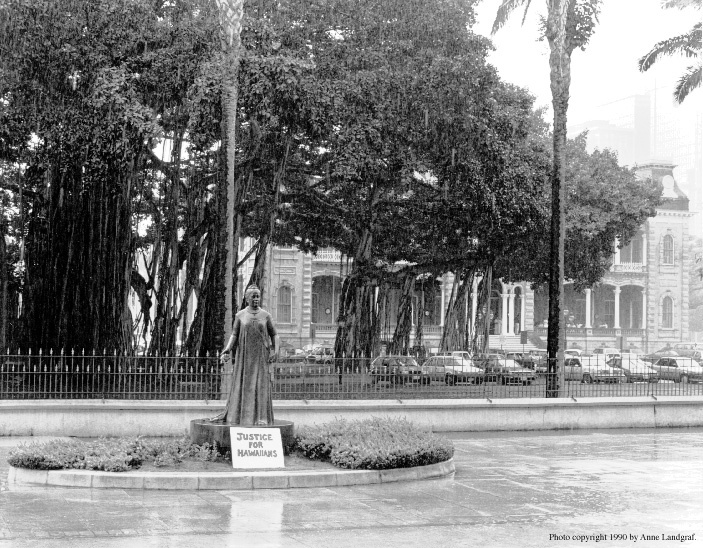 - Sovereignty demonstrators placed a "Justice for Hawaiians" message beside a statue of Queen Lili`uokalani, the last monarch to reign over Hawai`i. `Iolani Palace, in the background, is where the queen was imprisoned following her overthrow by pro-American businessmen in 1893. Afterward, the palace was used as headquarters for the new government. Photo copyright 1990 by Anne K. Landgraf. Chapter 4: The Wong Family: `Olelo Hawai`i / Hawaiian Language. - Lilinoe Kealoha Wong shares a story with Kalena Honda at a Punana Leo school in Honolulu. Parents of students at Punana Leo are required to know or study Hawaiian so they can reinforce their children's learning at home. Studies find that teachers in public-school immersion programs have difficulty maintaining Hawaiian as the teaching language with children who come from families where Hawaiian is not spoken at home. Photo copyright 1990 by Anne K. Landgraf. Chapter 10: Craig Neff: Ho`omana / Religion. 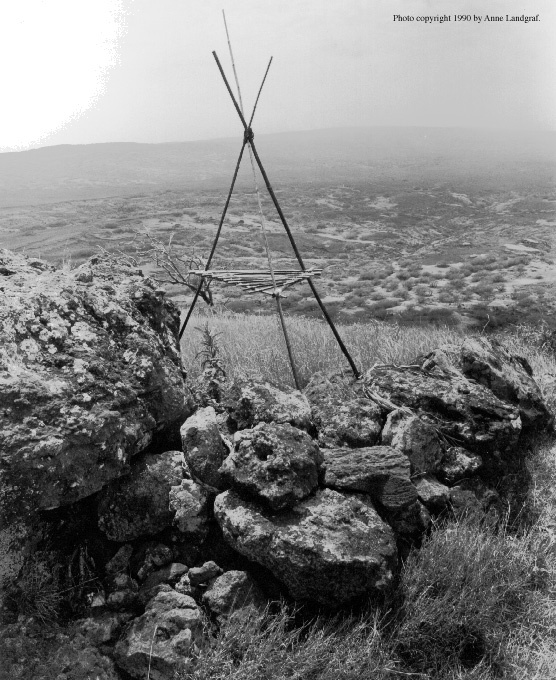 - An altar of lama wood, used to honor the god Lono, stands on the Kaho`olawe summit of Pu`u Moa`ula Iki. Worshipers believe their Makahiki ceremonies helped bring an end to fifty years of Navy bombing practice on the island. The federal government has promised funds to help clean up the ordnance that limits access on Kaho`olawe. Photo copyright 1990 by Anne K. Landgraf. 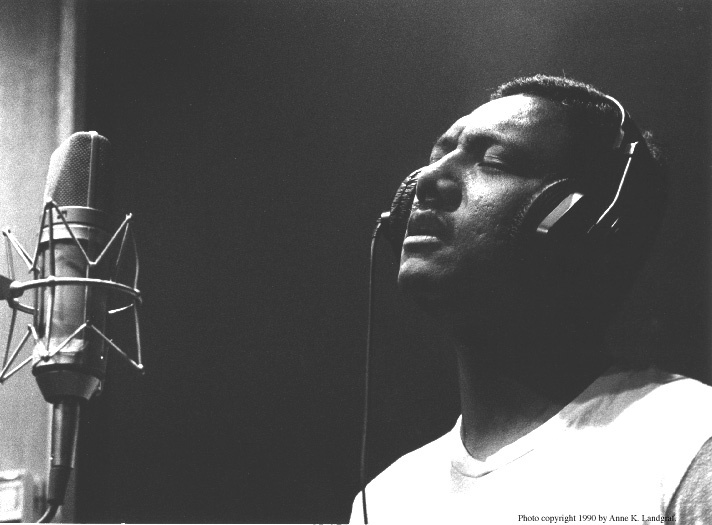 Chapter 2: Louis Robert "Moon" Kauakahi: Mele / Music. - Louis "Moon" Kauakahi records "Ho`oluana," the Makaha Sons' tenth album at Honolulu's Dolphin Sound studio. Photo copyright 1990 by Anne K. Landgraf. Chapter 5: Albert Kamila Choy Ching, Jr: Hoe Wa`a / Canoe Paddling. 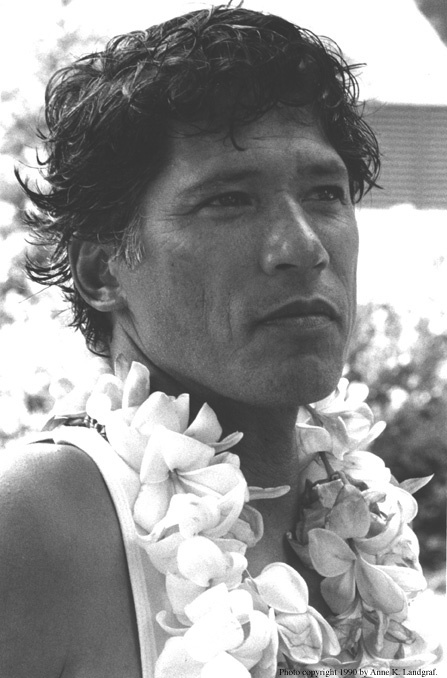 - Al Ching is one of a few Hawaiians in California still involved with outrigger canoe racing. He began paddling racing canoes thirty years ago, when the party after the regatta lasted longer than the competition. These days, his best paddlers train year-round so they will be strong enough to compete in the annual Moloka`i to O`ahu race. Photo copyright 1990 by Anne K. Landgraf. Chapter 3: Mapuana and Kihei deSilva: Hula / Dance. 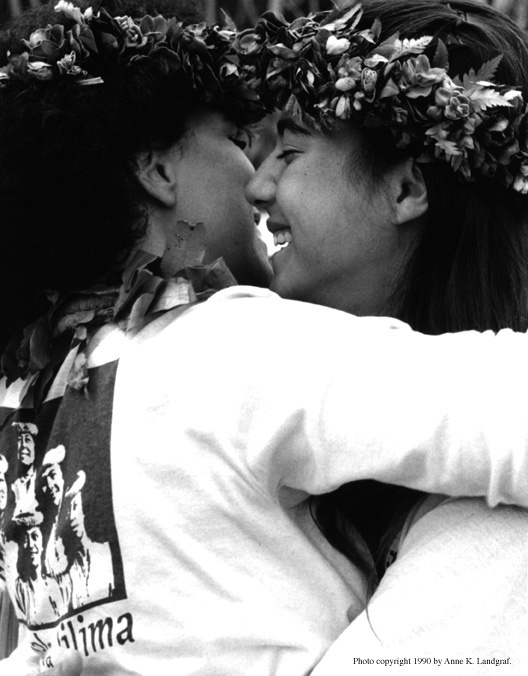 - Two Halau Mohala 'Ilima dancers embrace, sharing the love that helped the fifty-two women to dance as one at the Merrie Monarch Festival of hula. Photo copyright 1990 by Anne K. Landgraf. 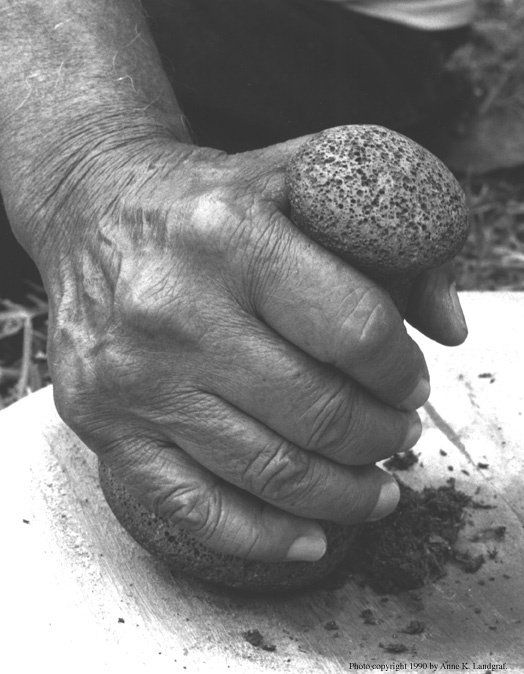 Chapter 8: William Kalunakeaki Kahu`ena: Lapa`au / Healing Hands prepare the medicine, but many healers believe faith in the remedy and in God are the most important ingredients for a patient's recovery. Photo copyright 1990 by Anne K. Landgraf. Cover Photo Namolokama Mountain catches rain that flows down to water five acres of terraces in Hanalei, Kaua`i, where Clarence Kaona carries on his family's kalo farming traditions. 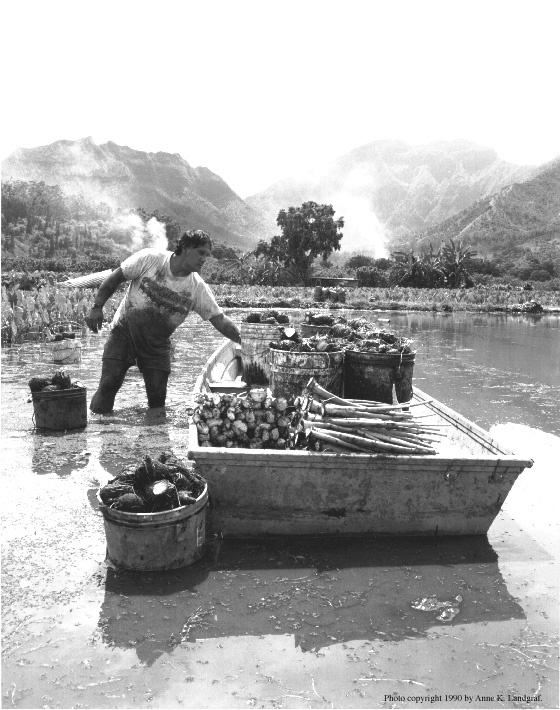 The skiff holds buckets of harvested kalo and the huli, cut-off stalks, that Clarence will replant. Photo copyright 1990 by Anne K. Landgraf. 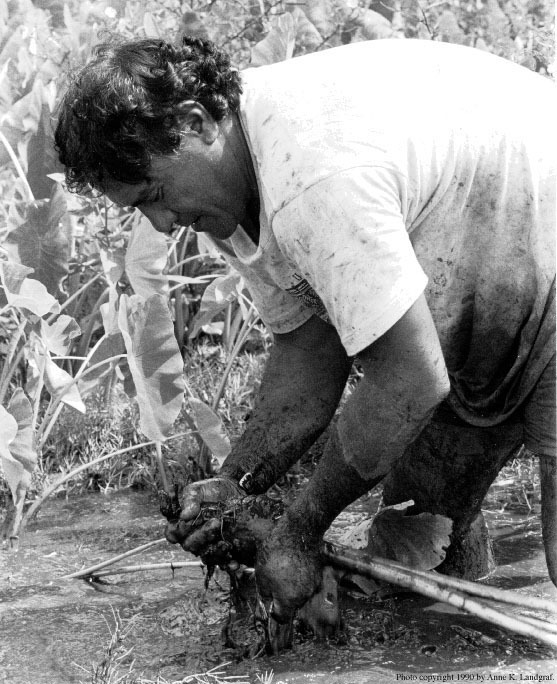 Clarence Eli Kaona: Mahi`ai / Farming With muck between his toes and under his nails, Clarence Kaona pulls up a kalo corm loosened from the mud by an 'o'o, a Hawaiian digging stick. After he tears off the corm's hair-like roots, Clarence sorts the kalo by size. Then he weeds the lo`i section, tossing the debris onto the banks to decompose.